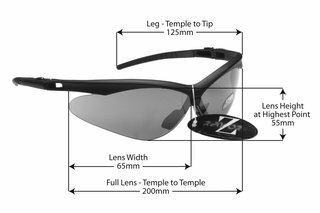 Lightweight Matt Black Frames Manufactured from a Shatterproof Polycarbonate Compound, With Black Rubber Head Grips and Black Rubber Nose Pad. Comfortable & Light. Very nice glasses. Comfortable and large enough to completely shield your eyes from the sun, even at the corner of the eyes.